At CES 2012, networking company Buffalo showed off a a router prototype built with the unofficial 802.11ac standards, sporting a 5G chipset from Broadcom that was only just announced this week. Buffalo only had a demonstration unit and prototypes available, but Technology Associate Anthony Brown said that Buffalo plans on shipping 802.11ac routers sometime in the fall. The 802.11ac standard is the successor to 802.11n, and transmits on a 5GHz band of spectrum like 802.11n, but the new standard uses channel bonding to access 4 times the channel width of 11n. Theoretically, 802.11ac routers should run at up to 1300 Mbps, and Buffalo’s show floor router set up was clocking in at speeds around 800 Mbps. Brown also said that part of the standard included so-called beam-forming technology, which recombines information being transmitted over the 5 GHz spectrum to make it more efficient; so rather transmitting data in all directions, it can aim a beam at whichever device is requesting information. Can your wireless router do this? Probably not. 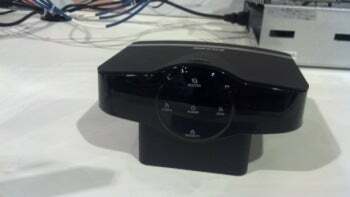 Buffalo says that its 802.11ac router should come out this fall. And when it does, it will contain two chipsets: one for 802.11n that transmits over the traditional 2.4 GHz band, and one for 802.11ac that will use the 5GHz band. This way, devices without 802.11ac capabilities will still be able to access Wi-Fi, although Brown expressed confidence that newer ultrabooks and next-generation tablets would be 802.11ac compatible. While the 802.11ac standard has not been ratified yet--and probably will not be ratified before the end of 2012 if this year at all--Brown said that Buffalo has a history of selling routers before certification. The comapny was able to sell 802.11n routers before certification in 2009 and, it plans to do so with the next standard as well.